Don't miss to join Mind Museum's exciting offers, programs and contests this summer! 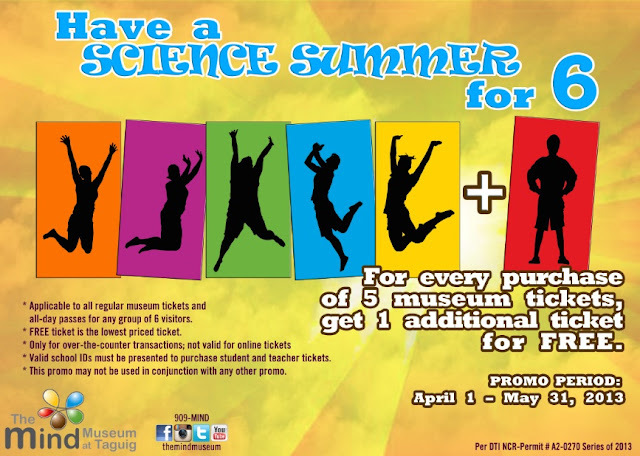 For every purchase of 5 museum tickets, get 1additional ticket for FREE. *Applicable to all regular museum tickets and all-day passes for any group of 6 visitors. *FREE ticket is the lowest priced ticket. *Only for over-the-counter transactions; NOT valid for online tickets. *Valid school IDs must be presented to purchase student and teacher tickets. *This promo may not be used in conjunction with any other promo. With rapid urbanization and an increased dependence on technology, the Survival Science Summer Program aims to promote the awareness and appreciation of the natural environment through lessons in science and practical survival skills. 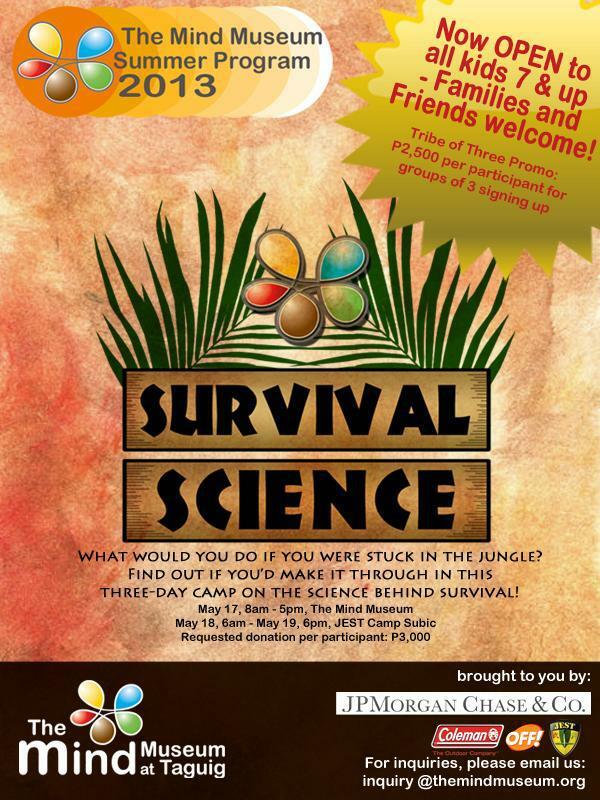 Engage in “tribe-building” activities including interactive lectures on biodiversity and guided practical tests on hunting and gathering for food, fire and shelter to name a few. JEST Camp Subic is the first survival school in the Philippines and has been offering Survival Certification Courses since 1963. Deadline for enrolment is on May 10, Friday. Have a Science Summer for 6 at The Mind Museum! 1. Snap a creative photo of your group of 6 at your favorite summer spot with a sign that says: We want a #ScienceSummerFor6 @themindmuseum". Sign can also be done using Photoshop or other photo processing tool. 2. 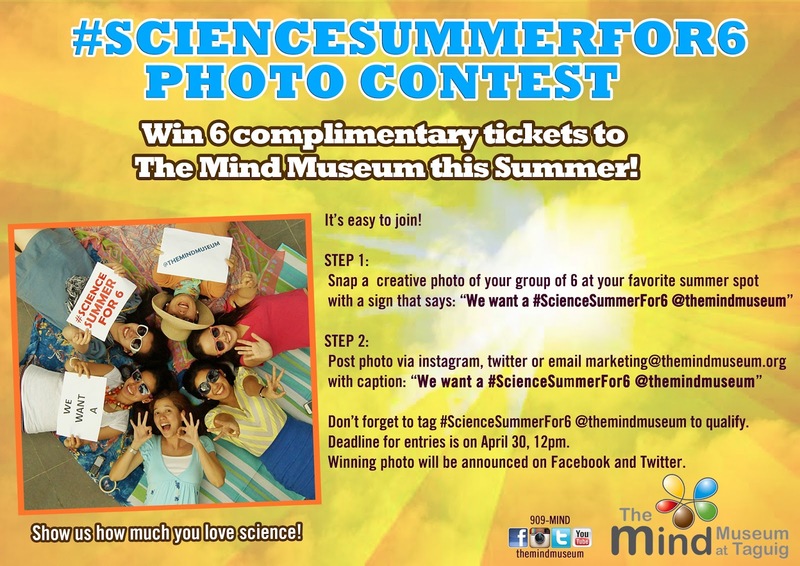 Post photo via instagram, twitter or email marketing@themindmuseum.org with caption: "We want a #ScienceSummerFor6 @themindmuseum"
Don't forget to tag #ScienceSummerFor6 @themindmuseum to qualify. Winning photo will be announced on Facebook and Twitter. Winner will get 6 complimentary tickets to The Mind Museum. Bloggers are also encouraged to join.